For a long time, the San Diego Comic-Con ticket buying process has been deemed unfair and rigged, with outrage sounding out through Twitter and Facebook after each ticket sale date. Up until now, it’s been a mad rush to click links and hope you get a good spot in line before memorizing credit card numbers and member id’s in order to get all the tickets you and your friends need. Personally, this has never been just a game of luck, it’s been a game of waking up early with high internet and browser speeds matched with expert clicking, but then I’ve never failed at my ventures to getting a ticket. However, this year CCI has done a major rehaul, as they have for many of the past few years, in an effort to “level the playing field“. I’m not really sure how fair this new lottery system is, but let’s go over a run down of what the major changes are before we get into their most recent changes. Except I’m pretty sure Jorah and Diana are not children. So one of the best things I’ve heard that has happened is the change on what you’ll get from the landing page. “In the past, non-members and ineligible attendees could access the landing page and waiting room, potentially taking up space in line that should be reserved for eligible participants.” This is not the case anymore, they will now require a validation with a member ID. Although viewers without member IDs could not buy tickets before, their presence bogged down the server and created more problems for people trying to buy tickets, like server crashes. More changes that have opened up opportunities for people to attend the Con has made it so that buyers who make it to the registration page can only buy three tickets, including yourself. These badges can be stored in a “shopping cart”, therefore making the buying process much easier than the previous method of signing in multiple times. They have permanently done away with 4-Day badges, especially since there is no longer a discount to getting the four day versus single days. Preview Night is now only available if you purchase all four nights, and for those accustomed to that option, you still have that ease at your fingertips. “For those who want to attend the entire show, simply check the Preview Night box, and all other badges (Thursday through Sunday) will be automatically checked for you. Just one click to get your 4-day with Preview Night option!” Preview Night will be unavailable if any of the four single day badges are sold out, so that means that the minute Friday or Saturday is unavailable so is Wednesday. I think the do-away of the 4-day button was a good choice on CCI’s behalf because I knew people who would buy 4-day passes just to make sure they had tickets, and often times would not attend all four days. The prices have been the same since last year, this change should have been made earlier. Speaking of ticket prices, let’s compare with last year’s prices. Adult 4-Day with Preview Night is now a total of $200, a $25 hike from last year’s $175. Adult 4-Day without Preview Night is now a total of $165, a $15 hike from last year’s $150. Adult Thurs-Sat tickets have gone up $3, but Sunday tickets have jumped $6. Junior and U.S. Military/Senior remain on the same pricing scale. Jr./Military/Sr. 4-Day with Preview Night is now a total of $100, a $13 hike from last year’s $87. Jr./Military/Sr. 4-Day without Preview Night is now a total of $84, a $7 hike from last year’s $75. Jr./Military/Sr. Thurs-Sat tickets have gone up $2, and Sunday tickets have gone up $3. It is still cheapest if you are a junior, a senior citizen, or in the military, but the ticket prices have still seen an increase across the board. Finally, the member ID page has had a rehaul of design and now include notifications and a more user-friendly interface. “Once the badge sale begins, everyone who is inside the waiting room will be randomly assigned to a registration session. Your assigned registration session is not tied to the time you entered the waiting room. There is no advantage in arriving early. No advantage. Hearing that gives me absolutely no comfort. If they were trying to make the system fair, I can’t say that I agree with this method. I have always believed in “The early bird gets the worm”. Every time I have bought tickets, it’s been through my own hard work of waking up early and checking social media to keep up with what is happening. This is the process, and while it’s stressful, it’s proven to work. I’m not saying what used to be was fair, it certainly had massive faults, but this idea does not exactly make me think “fair”. I guess it does level the playing field for people who might not want to research how to get tickets. But then those are the people that I might have a problem with. Year after year, I’ve seen CCI make more and more restrictions to ticket sales. On-site ticket sales were omitted (though that was definitely a benefit), pre-registration now excludes first-time ticket buyers, prices have been raised, member IDs have been utilized, and now the randomized waiting rooms. This has all been in an effort to make the ticket buying process “easier”. But is that what has happened? Alas it remains to be seen what the process will actually be like, and since they have confirmed that this weekend will not be the weekend for ticket sales, the waiting game continues. 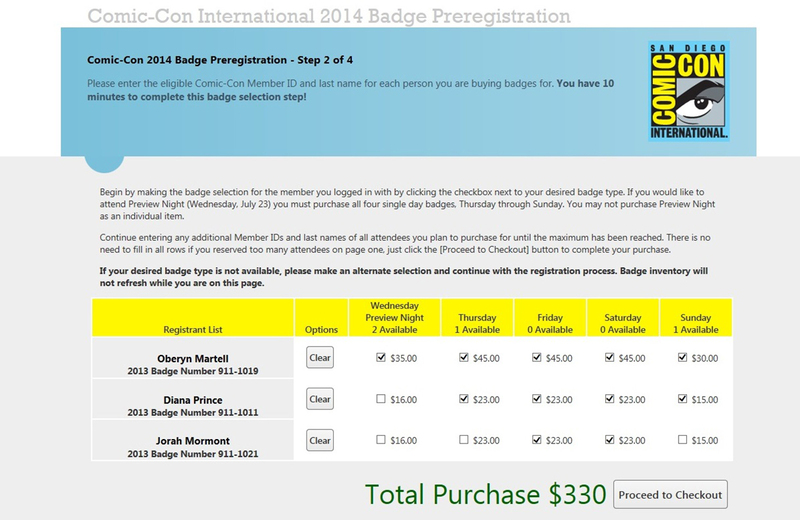 For those of you looking at a grander view of costs at SDCC, check out Kylee’s article (apply the new pricing of the tickets from this page). Also, because of the constant changes made to ticket registration process, this is our best how-to page until after pre-registration. Keep in mind, often times pre-reg is when the bugs are worked out on a live audience, so we’ll be back after the pre-reg period with our thoughts and opinions. Sound off on how you feel about the new waiting rooms, or any of the new changes that have been put in place. Are you buying for you and Sarah this year?